This 6 In Refractor Telescope is built near to scale. It has a lot of detail in the telescope and the tripod and is very realistic. It is built to populate a 3d room or scene in which it could be used either as central focus of the shot, or an object near the focus. This model is provided with all materials and textures and in several different formats. 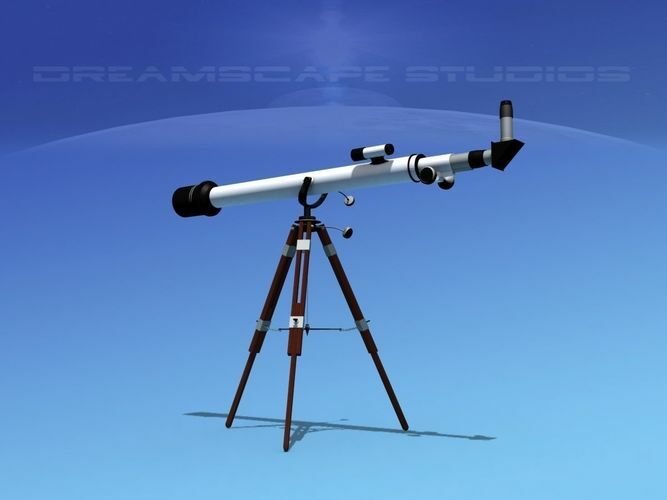 The refractor telescope is the least expensive of telescopes and the type generally used by the hobbyist to view the moon and planets or peering at things in the distance like ships on the horizon or subject blocks or miles away. This model is of a fairly good refractor which includes the star finder scope on the side, the flexible adjustment knobs that allow the telescope to be adjusted without transmitting any shaking to the scope, focus adjustments and a forty five degree eyepiece allowing the viewer to look down into the scope more comfortably rather than through it in an uncomfortable position.